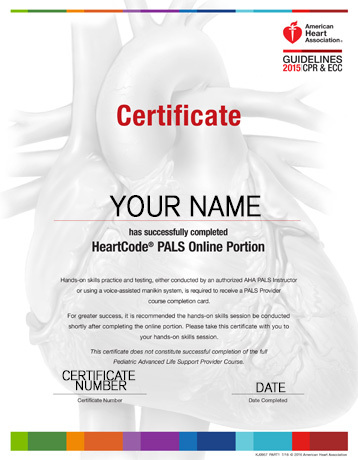 Course Info: HeartCode PALS is a web-based, self-directed program that teaches healthcare providers knowledge and skills needed to recognize and prevent cardiopulmonary arrest in infants and children. Using eSimulation technology, students assess and treat patients in virtual healthcare settings where they can apply their knowledge to real-time decision-making and skills development. 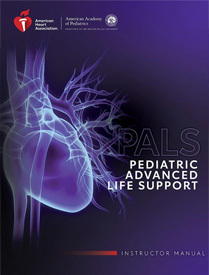 Debriefings and coaching are provided immediately after each simulation to facilitate learning about pediatric advanced life support. Precourse Self Assessment Test: Pre-Test is an optional module to help you pass the in-person Megacode testing. Pre-Test Available at www.heart.org/eccstudent Click on "Pre-course Assessment" Password Give on Registration.